The Lenhardt Library at the Chicago Botanic Garden has a number of special and unique works in its collection, but none more spectacular than Ellen Robbins's collection of 18 watercolors. These stunning illustrations on 18 plates capture different leaves and branches at the height of their autumn color. These plates are so realistic that on several occasions, exhibits of these watercolors in the Library have initially confused visitors, imagining the watercolors to be actual specimens from the field, rather than artistic renditions. Such is the talent of Ellen Robbins (1828–1905): One contemporary noted that her work was "so natural that bees might light" on her watercolors of spring wildflowers. We are fortunate to know about Robbins thanks to her own autobiographical essays, "Reminiscences of a Flower Painter," published originally in 1896 in the New England Magazine, as well as an excellent summary that appeared more recently (113 years later!) in the Town Crier, the newsletter of the Historical Society of Watertown, Massachusetts. These sources provided the details in this column. Ellen Robbins was born in 1825 as the youngest of seven children in Watertown, about nine miles west of Boston on the Charles River. Her father died while she was still a child and his soap-making factory vanished in a fire. At an early age, Robbins was asked to contribute to the family by finding work appropriate to a young person at that point in the nineteenth century. She tried needlework and fabric design, but her enthusiasm for both ventures was not great. She found herself constantly thinking about a box of watercolors given to her by an aunt, and her visits to relatives in New Hampshire, where she experimented in painting wildflowers "the way they looked" to her. Finally, at the age of 20, one of her relatives recommended that she take some art lessons with artist Stephen Salisbury Tuckerman (1830–1904) at his School of Design. Tuckerman obviously was successful with Robbins, who, by her admission, was "able to draw flowers with ease" after completing her studies. At this point, she began to concentrate on wildflowers, producing books containing 20 or so illustrations, selling them for $25 per book, a considerable sum in the middle of the nineteenth century. These books were popular, and led Robbins to expand her subject matter to create books with watercolors of leaves in the autumn. Autumnal Leaves by Ellen Robbins. Robbins's career accelerated in the second half of the nineteenth century, with increasing demand for her watercolors and paintings as well as her instructional assistance as an art teacher. A shop in Boston sold her paintings, and Robbins could hardly keep up with the demand. She became fashionable among the most important Bostonian families, such as Henry Ward Beecher (1813–87), brother of Harriet Beecher Stowe (1811–96). Robbins was creating floral illustrations not only on paper and canvas but also on china and furniture, to satisfy her patrons and fans. She even created a frieze in the Browning Room of College Hall at Wellesley College, but unfortunately the Hall (and frieze) were destroyed in a 1914 fire. Her success meant that she could spend her summers in Maine at first, then off the coast of New Hampshire at the summer residence of poet and writer Celia Thaxter (1835–94). Robbins also was able to visit Europe with her sister in 1873. Eventually her popularity led to reproductions of her paintings appearing for sale, thanks in part to advances in chromolithography. The specific collection of fall leaves in the Lenhardt Library was probably created in 1868. An inscription in this work reads "'To my Husband' Sept. 1st '58 – Sept. 1st '68." It seems that this special work was a present on a tenth wedding anniversary, but a specific name is not attached to that dedication. This volume was presented to the Library of the Massachusetts Horticultural Society in November 1934, by Miss Gertrude M. Graves. There is little information available about Miss Graves, except that she was a cousin of Emily Dickinson (1830–86). Given Dickinson's well-known heightened sense of privacy, it is probably doubtful that Graves knew Dickinson. However, there is evidence that Dickinson's younger sister, Lavinia, knew Graves. 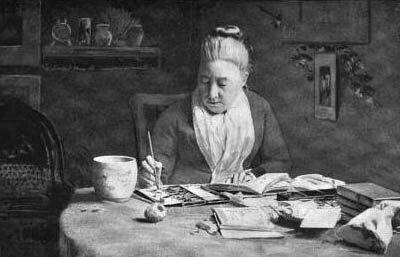 Lavinia discovered Dickinson's poetry, and eventually arranged for her poetry to appear first in print in 1890. Lavinia Dickinson recruited Graves to create a new image of her sister Emily, based on the only known portrait of Emily, a daguerreotype from late 1846. Graves in turn asked Laura Hills, a painter of miniatures, to create a new image of Emily Dickinson. This evidence indicates that Gertrude Graves was well connected to the Bostonian artistic community. She probably did not consider Ellen Robbins for this task of creating a new picture of Emily Dickinson, since Robbins, by her own admission, was not keen on portraiture, preferring wildflowers and leaves to humans for artistic interpretation. How exactly Graves acquired this volume of 18 watercolors is not known, but we are grateful that it found its way to the Massachusetts Horticultural Society and eventually the Chicago Botanic Garden. Each autumn, these watercolors seem to come alive.